Oct. 29, marks National Cat Day in the U.S., and while we don't seem to have quite the same official holiday in Canada, that doesn't mean we're not willing to celebrate our feline friends. While there's a variety of ways to celebrate this day — like say, watching hilarious cat videos online, which you were probably doing anyway — we thought we could honour the love of cats by breaking down its biggest stereotypes. That's right, we've taken on the cat lady and replaced her with cat dudes. 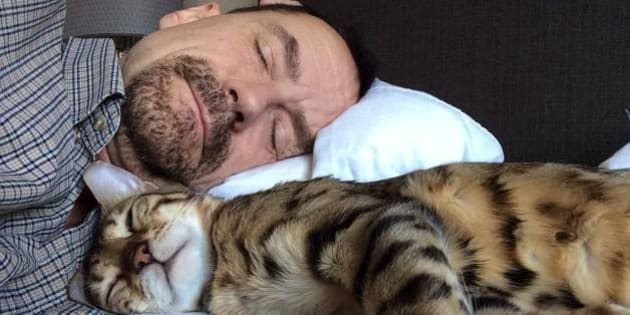 So forget all you think you know about bathrobes covered in soup stains and cat fur, and instead, take the time today to check out some HuffPost Canada male readers' love for their cats. And if it makes you want to get out there and adopt a pet, all the better, we say. Have a cat dude picture of your own to add? Leave it in the comments, or email it to us at CanadaLiving@huffingtonpost.com.